← >The Chinese are coming to plant rubber trees, whose lands will be illegally grabbed next? National flag carrier Vietnam Airlines plans to launch an Indochina service following the success of its first one, the Vietnam Aviation Administration (VAA) said. The airline had submitted a plan for the purpose to the administration for approval, a VAA official said. The service would start in Hanoi and go through Laos’ Luang Prabang and Cambodia’s Siem Reap before landing at Ho Chi Minh City and follow the same route in the return direction, the report said. There were no problems in terms of policy, the official said. 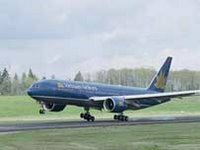 Vietnam Airlines currently has a daily Indochina service between Hanoi and Ho Chi Minh City with stops in Laos’ Vientiane and Cambodia’s Phnom Penh. A recent meeting of aviation officials from the Sub-Mekong region, which includes Indochina, also agreed to establish a number of new tourist routes.